Most of you guys are probably facing long dark and cold winter months as we speak. But here in Dubai, after a loooooong summer, temperatures are finally dropping to some comfortable mid to upper 20C. Which means that the BBQ season has started. We haven't had our debut for this season, but I am sure it will be sometime very soon. While husband is always the grill master in charge ( in fact, I think I have never actually bbq-ed myself, ever in my life, not even turned a sausage on the grill). I normally do the starters, side dishes and salads and I am happy with it. Sometime during the hot summer I came across this sweet potato salad. 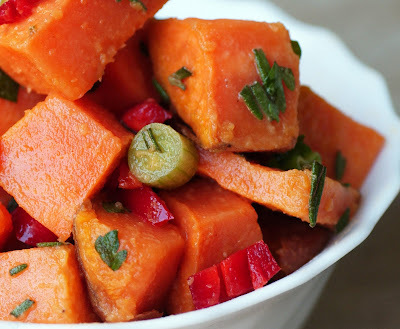 What I love most about this salad is the combination of sweet potato, chili, honey and rosemary. It really works well together. It was so nice, I had the whole salad myself (yes all 1 1/2 pounds of sweet potato). It is definitely a dish that goes well with nicely marinated and grilled meats. I will make this one on our next BBQ night for the public. I am convinced it will become one of our BBQ classics. Cut the sweet potatoes into slices (with the peel) (about 2cm thick) and steam until just barely tender, about 6 minutes. Drain; run under cold water to cool. Cover and chill at least 1 hour and up to 1 day. To make the dressing, whisk first 6 ingredients in small bowl. Gradually whisk in olive oil. Season to taste with salt and pepper. Transfer potatoes to work surface. Cut into bite-sized wedges Preheat oven. Brush potato wedges with canola oil. Sprinkle with salt and pepper. Roast potatoes, about 2 minutes per side. Place potatoes, poblanos, green onions, and parsley in large bowl. Drizzle dressing over; toss to coat. Season to taste with salt and pepper. Serve warm or at room temperature.